We were in Bangkok for a week recently and I intentionally left my camera at home. Sometimes when I am creating photographs, looking for them, planning them, waiting for the moment to develop, I am simultaneously plugged in to where I am and oblivious at the same time. On this trip, I wanted to practice being present, without preservation, noticing and letting the moments bloom and pass, small bright treasures as delicate in the memory as shooting stars, drifting afterward into that dreamy space between remembering and wondering whether they really happened at all. This is a photograph I took a couple of years ago. 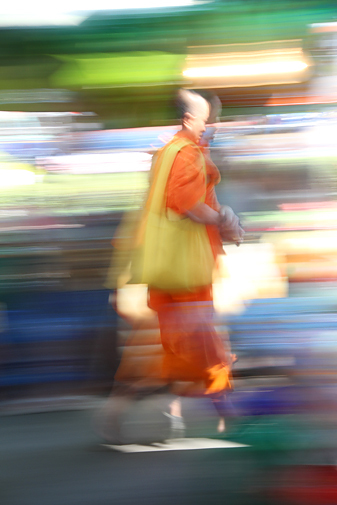 Living in Southeast Asia, one becomes accustomed to the sight of orange-clad monks. In Thailand, boys who become monks for three months guarantee their mothers’ places in heaven. And yet, as common as it is, the glimpsed brilliance of that orange is always so striking, humility boldly announced, a visual catharsis of the Bangkok heat you swim through, a flame flickering in the crowd of traversing bodies, the one true thing you almost caught in the corner of your eye that leaves you head-turned and searching. This entry was posted in Abstract & Motion, Observational, Photography and tagged Bangkok, Buddhism, Buddhist, Color, Monk, Thailand, Urban on August 19, 2013 by damienpitter.